PamMichele: Photo: Kanye as a Wookie?? 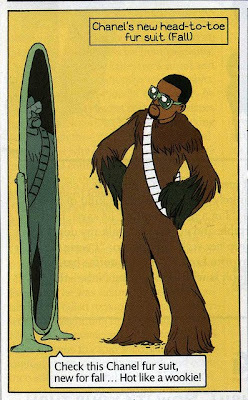 New York Magazine recently dreamed-up ideas of what Kanye West would tweet next in article titled "Kanye West Tweets the Fall" and this was one of them: Kanye sporting a Chanel-designed Wookie suit made just for him. Taking note from his choice of apparel at the 2010 VMAs, they may not be too far off. Those at the Official Star Wars Blog LOVED the idea and posted the picture on their site. For more Kanye-tweet scenarios, please visit New York Magazine (online) and/or purchase the print issue on newsstands today!